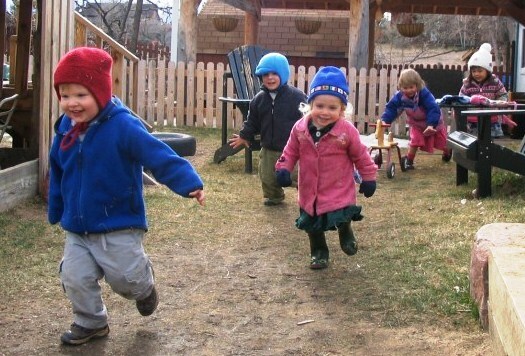 Running Away - Joyful Toddlers! Use Imaginative Language You’re walking hand-in-hand toward the shoes. When you get near them, cup your hand around your ear and say, “What’s that I hear? Is there a little mouse hiding in your shoe?” Kneel down and pick up the shoe, looking inside. “No, no mouse! Your shoe is empty! Wait–now it’s full!” Slip it on his foot. Then do the exact same thing for the next shoe, with the same words, same intonation, everything. “What’s that I hear? Is there a mouse in this shoe?” etc. It’s almost like a little play or a puppet show that you’re putting on, that ends with his shoes being on his feet. This type of activity is so enjoyable that children often forget that they wanted to say ‘no’ in the first place. If you stop announcing, use motion first, and imaginative speech, I be this will help a lot. If he does still run, getting mad won’t change anything. Simply swoop him up and spin him around two or three times, then go over to what you need to do, using imaginative language if possible. The spinning seems to get some of the need for running out of their system, or maybe they’re just dizzy so they can’t run as well? Either way, they seem to like it. Or, incorporate running into the routine. I know one mom who developed a ritual with her runaway son for getting dressed. She’d put on one item of clothing, and he’d run out of the room. She’d sit there quietly, and he’d come running back. She’d give him a big smile and put on the next item, and out he’d run again, only to return for the third. It wasn’t a speedy process, but it was one that they could both enjoy. Thanks for your reply! I think most toddlers run because it’s fun, and it’s even more fun when we chase after them (whether we’re enjoying or annoyed…I bet your toddler would enjoy it even more if you enjoyed it too, even though it’s still fun either way). I think the the backpack leashes can be a really good way of letting a child be mobile while making sure everyone keeps safe.